The product page of your dashboard gives you a simple view of all your products. To manage your uploaded products use the icons under the Manage header. You can view, edit, delete or duplicate the products. To search for a specific product use the search bar at the top of the product list. You can search for the title of the products and if you have uploaded categories you can easily filter by them. 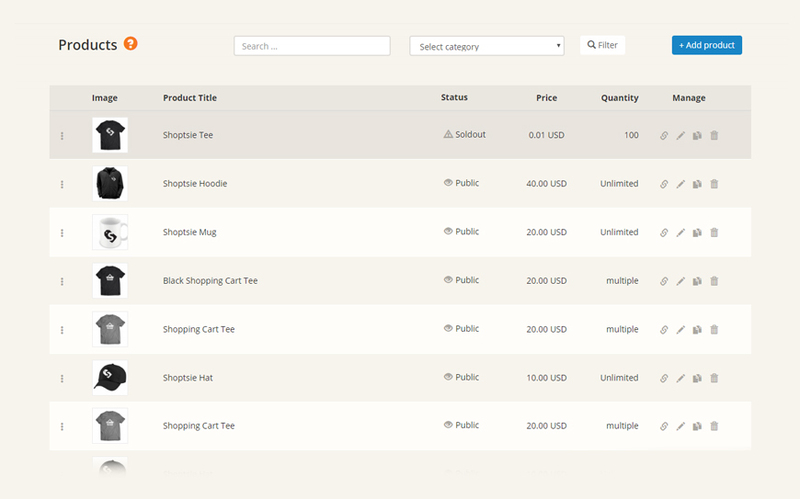 Rearrange the order of your products by drag-and-drop. This will change the order of the product in your store as well. Adding a new product is as easy as posting on Facebook. First of all, make sure you have some beautiful images of your products and some nice descriptions. Go to the Products menu and click the Add Product button. On the next page add a Title to your new product, set if the product is Only for order and then write the Description..
Upload images. The number of images that you can upload is based on the plan that you chose. If you are using Free Plan you can upload only 1 image. The other Plans contains 6 images per product. As the next step, set the switcher to Yes if you are selling digital products and add the URL of your digital file. Add the price of the product and set the product number of items you have in stock. Switch the unlimited switcher to Yes if you have unlimited items of this product. Adding the weight of the product will help creating the weight based shipping options. The stock, the price and the weight are not valid when the product has options/variations. You can add options/variations to the product such as Size, Color or Material. You can add as many options as you like and please set the price for each. If a certain products has no option, don’t add options/variations. 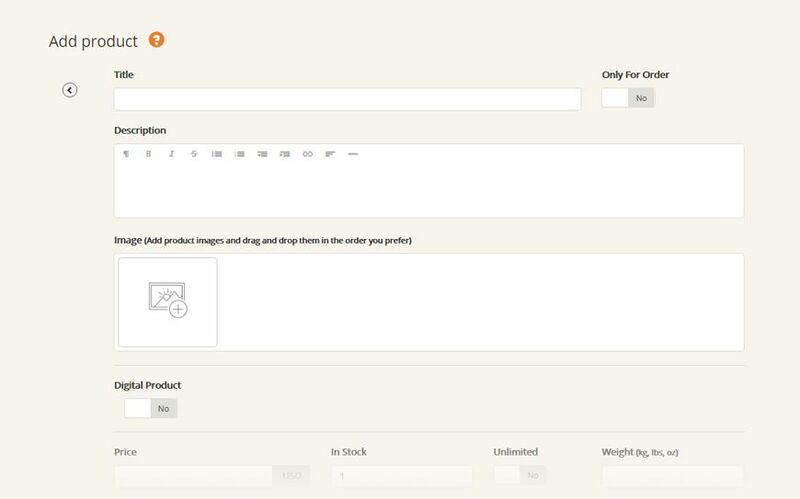 Select the categories for the uploaded products. You can add keywords that describes the product. Keywords help your customers find your product.